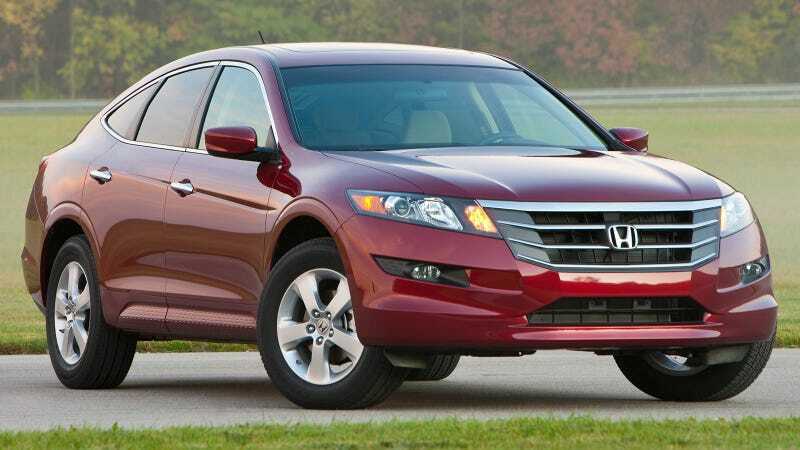 Today I saw a Honda Crosstour on my way to work. This reminded me that I’ve actually driven a Crosstour, and I liked it as a comfy cruiser all-weather DD type car, even though it’s hideous to look at. So I took a crack at trying to clean up the looks a little bit. My first thought was to try and do something with the awful, too-big grille. So I made the large gray plastic bits on the side body color, and I made the chrome cross bars black. I left the thicker top cross bar chrome, because I felt like something was a little off when I made it black. But then I realized maybe the reason the black top cross bar looked weird is because it contrasts with the chrome window trim and door handles, so I blacked out the window trim and made the handles body color. Maybe now we’re getting somewhere. The ride height and wheels are still all doofy but this feels a lot cleaner to me and I don’t feel like messing with the wheels and ride height in Pixlr at work. But, I kinda like it much better this way. Maybe?